November 2014 - Midwest Sports Publishing Network, Inc.
DULUTH, MN (Nov. 30, 2014) –Professional snocross’ all-time winningest racer, Monster/Arctic Cat/Ram’s Tucker Hibbert, has been racing at Duluth’s Spirit Mountain for 15 years. 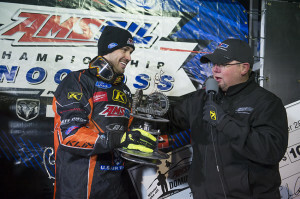 And today, round two of 2014-’15 AMSOIL Championship Snocross, powered by Ram, Hibbert tapped into that vast experience to top the rest of the field in the premier Pro Open class. Hibbert sweeps his qualifiers, claims the Pro Open main at the Spirit Mt. 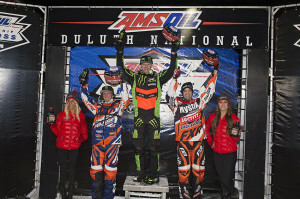 AMSOIL Duluth National; 16-year-old Norwegian sensation Elias Ishoel wins Pro Lites. 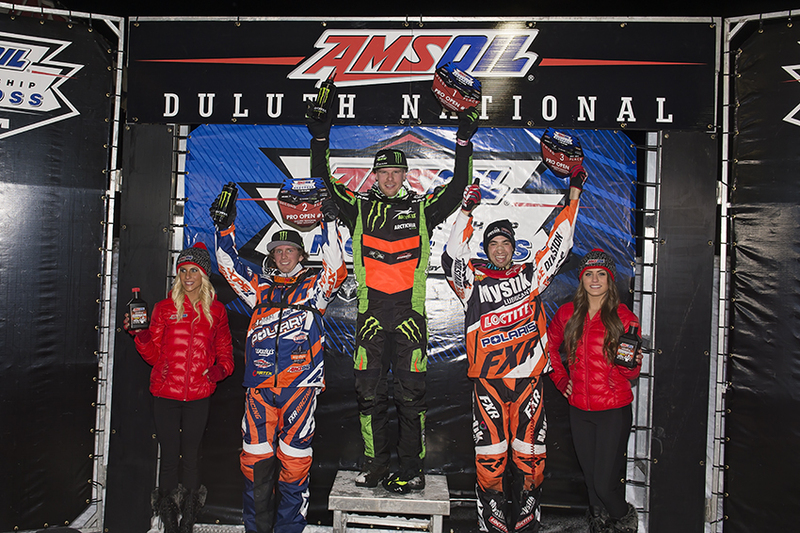 DULUTH, Minn. (Nov. 29, 2014) – Pro snocross’ all-time winningest racer Tucker Hibbert (Monster/Arctic Cat/Ram) picked up right where he left off last season, winning the Saturday night AMSOIL Duluth National season opener of 2014-’15 AMSOIL Championship Snocross, powered by Ram, atop Spirt Mountain ski area. In the support Pro Lite class main event 16-year-old Norwegian snocross sensation Elias Ishoel captured this win in his first-ever AMSOIL Championship Snocross event in dominant fashion. Hibbert, who won both of his qualifying races earlier in the evening to qualify in the No. 1 spot, got an admitted poor jump off the start in the main event and was pinched off down the straightaway and back into 6th place. Pulling the holeshot and leading was Hibbert’s chief rival, No. 2 overall Pro Open finisher last year, Kody Kamm (Hentges Racing/Polaris). With Kamm up front and Mystic/Loctite/Polaris’ Kyle Pallin close behind in 2nd, the two took charge of the first half of the race. But Hibbert began to stalk the leaders, moving up to 5th place by lap three, then past Logan Christian (Christian Bros./Arctic Cat) in to 3rd place by lap six. Kamm enjoyed a four second lead at lap six, but Hibbert kept on the gas and cut a second off Kamm’s lead on each ensuing lap. Just after the halfway point (Lap 12 of 20) Kamm, Pallin and Hibbert were all within a sled length of each other in the corners. Hibbert first got past Pallin, then was up onto Kamm. The anticipated battle only lasted about a half a lap as Kamm, admittedly, suffered some arm pump and wasn’t able to keep his speed up in the tricky uphill rhythm section. “My arms started to get a little bit tired and I faded on the uphill – and that’s where the guys got me,” said Kamm. Hibbert, who lapped the entire field at last year’s Saturday AMSOIL Duluth National opener, put the hammer down and distanced himself from the rest of the pack – making up for his mid-pack start with a powerful charge to the front and equally strong finish. In their battle for 2nd and 3rd Pallin and Kamm would get together – mid-air – and land with their skis tangled. But the two (along with Hibbert) had such a lead over the rest of the field that it didn’t matter as Kamm held onto 2nd and Pallin 3rd. Rounding out the top five in the Pro Open class were Tim Tremblay (AMSOIL/Scheuring/Ski- Doo) in 4th and Justin Broberg (Hentges Racing/Polaris) in 5th. Rocketing virtually out of nowhere to win the Pro Lites on Friday was Norwegian teenager Elias Ishoel. Running the Warnert Racing-tuned NSK/Makita Ski-Doo, Ishoel took the lead from Wisconsin’s Travis Kern (KC Motorsports/Arctic Cat) on lap two, diving low when Kern went high on the course’s bottom turn. Ishoel kept it on the main jet, pulling the rest of the field through the rhythm section to the top of Spirit Mountain. He stayed on it through the 14 laps and was never challenged, impressive for a 16-year-old in is first-ever AMSOIL Championship Snocross Pro Lite main event. With Ishoel established up front, Kern and fellow Wisconsin native Jake Angove (Polaris) moved into 2nd and 3rd, well ahead of No. 1 Duluth Pro Lite qualifier Trevor Leighton (Leighton Motorsports/Polaris) and last year’s Duluth Pro Lite winner James Johnstad (Judnick Motorsports/Polaris). As the rookies battled up front at the midway point, Johnstad was charging hard and moved past Angove on lap eight. Going all out to catch the frontrunners, Johnstad would go down and Angove moved back into podium position (3rd). Privateer Arctic Cat racer Corey Watkinson would also make a move on the podium, but went down as well. When the fire pots lit, signaling the first racer across the finish line (Ishoel), Angove had 2nd place and Kern grabbed 3rd. Rounding out the top five were Andrew Carlson (Carlson Motorsports/Polaris) in 4th and Travis Muller (Cottew Motorsports/Polaris). Action at Spirit Mountain continues on Sunday with the round two of the 2014-’15 AMSOIL Championship Snocross, powered by Ram, series. 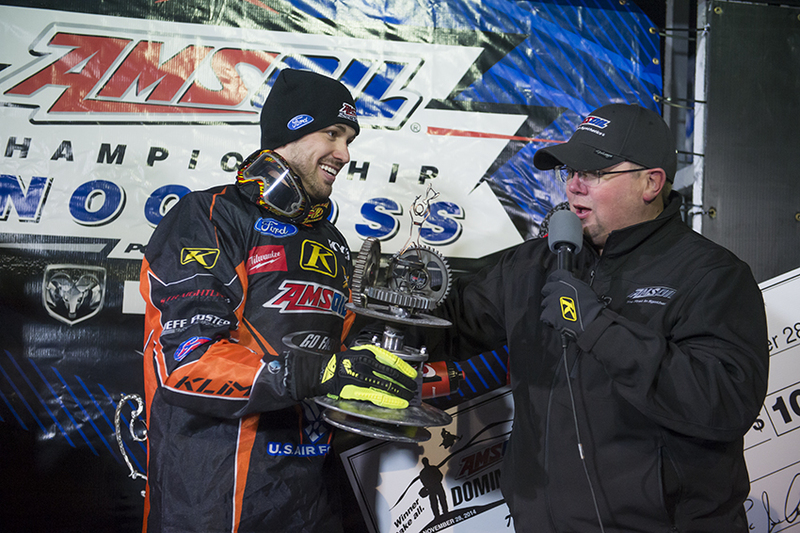 MINNEAPOLIS (Nov. 28, 2014) – Former AMSOIL Championship Snocross, powered by Ram, champion Tim Tremblay (AMSOIL/Scheuring/Rockstar/Ski-Doo) was unstoppable atop Duluth’s (Minn.) Spirit Mountain tonight, defending his title in the one-on-one AMSOIL DOMINATOR® event to open the 2014-’15 AMSOIL Championship Snocross season. Cruising through the DOMINATOR’s bracket-style format with wins over Arctic Cat’s Logan Christian (Rd. 1), Hentges Racing/Polaris’ Kody Kamm (Rd. 2) and Mystic/Loctite/Polaris’ Jake Scott (Rd. 3), Tremblay would tow Cody Thomsen (Arctic Cat) and Ross Martin (Judnick/Polaris) up the start hill in the final race and power home to a convincing win in the three-lap main event. Making the finals against the Canadian Tremblay were Cody Thomsen (Arctic Cat), who got by Mike Bauer (Haala Racing/Arctic Cat) in Rd. 1, Corin Todd (Leighton/Polaris) in Rd. 2 and Martin in Rd. 3. Martin would fight his way back through the Last Chance Qualifier with a win over Scott, and started in the second row behind Tremblay and Thomsen in the main event. -Thomsen pulled a monster holeshot off the start and led Martin up the hill and into the first turn. Charging hard to catch Thomsen, Martin fell off his sled on the last lap and was relegated to the LCQ. -Tremblay went outside/inside on the first turn and got past Scott, opening up a gap that Scott couldn’t close after the opening lap (of three). -Rd. 2’s best race was between Sweden’s Adam Renheim (Boss Racing/Ski Doo) and Scott. The former Pro Lite champ Scott would get off the start first and took the lead after the opening lap, only to be caught in the bottom corner by Renheim, the only pass made on that section of the track all night. Scott would then take advantage of a slight Renheim mistake on the uphill, re-passing the Swede and rocketing into the semis. -In the most anticipated matchup of Rd. 2, Tremblay met Hentges/Polaris racer Kody Kamm. Tremblay used a strong shoulder-to-shoulder move to stop Kamm’s initial pass attempt on top of Spirit Mountain, then held off an insane jump attempt by Kamm that resulted in the night’s closest finish – 33/100ths of a second at the checkers. -Todd would lead Thomsen off the start, but cased a jump in the rhythm section, momentarily checking up. This would be all Thomsen would need to take the lead and the eventual win. -After taking last year off to free ride and film, McGuire Racing/Arctic Cat’s Brett Turcotte pulled the upset of the night when he topped defending ACS champ Tucker Hibbert (Monster/Arctic Cat/Ram) in the first race of the DOMINATOR. Hibbert was actually DQ’d for nudging Turcotte off the track on the first turn. 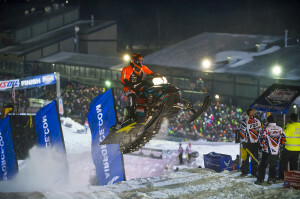 -“I heard a sled held wide open and he (Hibbert) bucked me off my sled,” said Turcotte. -Martin nailed one of the best passes of the night when he went high, then dove down on Lincoln Lemieux (AMSOIL/Scheuring/Rockstar/Ski-Doo) on top of the hill for the lead and eventual win. -The closest race of round one was Justin Broberg (Hentges/Polaris) versus Renheim, with Renheim holding off a charging Broberg at the tape for the win. -Other round one winners included: Scott over teammate Kyle Pallin (Mystic/Loctite/Polaris); Defending DOMINATOR champ Tremblay over Christian; Kamm over Andrew Lieders (Mystic/Loctite/Polaris); Pro Open rookie Todd over David Joanis (Royal Distributing/Arctic Cat); Thomsen over Bauer. About the AMSOIL DOMINATOR: The unique event pits 16 of the world’s top Pro Open-class racers against each other in a one-on-one, bracket-race format. The top dogs from Friday’s Pro Open qualifying session move on in this winner-take-all contest for a chance at winning a cool $10,000, along with the custom AMSOIL DOMINATOR trophy designed and constructed by AMSOIL. Action at Spirit Mountain continues on Saturday with the opening round of the 2014-’15 AMSOIL Championship Snocross, powered by Ram, series. Beginning with AMSOIL Championship Snocross’ season-opening round in Duluth, Minn. and running through the season finale in Lake Geneva, Wis., CBS Sports Network will air 17 one-hour programs of the ACS races. Safe, responsible riding is actively supported and promoted by organized snowmobiling. Snowmobile safety trainers have been conducting snowmobile safety classes for decades in the United States and Canada and in 1995 the community embraced the Safe Riders! You Make Snowmobiling Safe© safety campaign – the guidepost for safe snowmobiling behavior. The Safe Riders! campaign highlights that individual behavior and responsibility is the key to making snowmobiling safe. Snowmobilers understand that snowmobiling is fun, but it is work too. It challenges the body and the mind and you need to be attentive while snowmobiling. Safe snowmobilers know their abilities and understand not to go beyond them. Snowmobile safety begins with the machine, which is built to the highest standards. It is the responsibility of snowmobilers to keep their machine in top running condition following all of the recommended pre-ride checklists found in the owner’s manual and making sure the vehicle is in top notch shape before riding. Snowmobilers also understand the need to dress appropriately while snowmobiling. Individuals must wear warm clothing, generally supplied through the snowmobile manufacturers and dealers. The clothing includes dressing in layers with high quality jackets, bibs, boots, gloves and a certified helmet. Snowmobilers need to think ahead and prepare where they are going to ride. It is best to file a plan with family or friends and let people where you are going to snowmobile. You need to be familiar with the riding area and or ride with individuals who have been there before. -Smart Riders are safe riders and they take snowmobile safety training/refresher courses. -Get the Training: Take an avalanche course which will highlight key issues. -Get the Forecast: Make a riding plan based on the current avalanche and weather forecast. -Get the Picture: If you see recent avalanche activity, unstable snow exists. Riding on or under slopes is dangerous. -Get Out of Harm’s Way: One at a time on all avalanche slopes. Don’t go to help your stuck friend, the extra weight could initiate an avalanche. Also, don’t group up in runout zones or at the base of mountains. Snowmobile safety training courses are available throughout North America and can be found by visiting your state or provincial snowmobile association website. For a list of all of the snowmobile associations/federations, visit our web site. To interact with other snowmobilers, visit and “Like” our Facebook page. REMEMBER TO ALWAYS BE A SAFE RIDER!!!!! 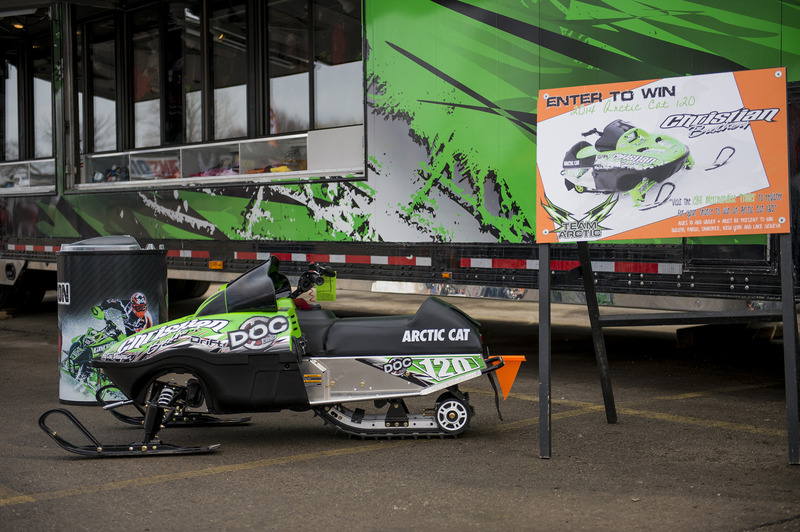 Fertile, Minn. (November 25, 2014) – Christian Brothers Racing will be giving away a new Arctic Cat ZR120 snowmobile at the ISOC Duluth National Snocross this coming Sunday, November 30. Fans can register any day of the three-day ISOC Duluth National Snocross, November 28-30, and any child 10 and under is eligible to win. Sign up at the Christian Brothers Racing merchandise trailer parked outside the chalet. The child entered must be present at the race on Sunday to win! For the past two seasons Christian Brothers Racing has teamed up with Arctic Cat and ISOC to give away a snowmobile at select ISOC National snocross events. It is free to enter and the only requirement is the child entered is age 10 or under and is at the race when the winner is drawn. Look for the Christian Brothers Racing merchandise trailer at the events listed and enter to win. For more information on ISOC visit www.isocracing.com. For more information on Christian Brothers Racing visit www.christianbrosracing.com.